I harvested potatoes for the first time last fall. I imagined digging potatoes to be back breaking work with a pitch fork. It wasn't like that at all. I used my hands and a soil knife to loosen the soil and pulled up Russet potatoes. It was so easy in the lovely soil which the Hawkin's family has been working to improve for years. All the straw heaped on top meant the potatoes were practically at soil level. Apparently I'm not very good at harvesting potatoes yet because this spring Zack harvested some new potatoes when he went to put this years squash in the same bed. Well, you live you learn. To harvest potatoes all you do is push the straw away from the base of the potato plant. Then gently yank the plant out of the soil. If you do it right you will see the seed potato the plant grew from. It looks like and old chunk of potato. You'll probably be able to see a couple potatoes too. Grab those up and then dig around a bit to find any remaining. The vast majority will be within the diameter of a basket ball at the base of the plant, but check in a three foot diameter just to be safe. 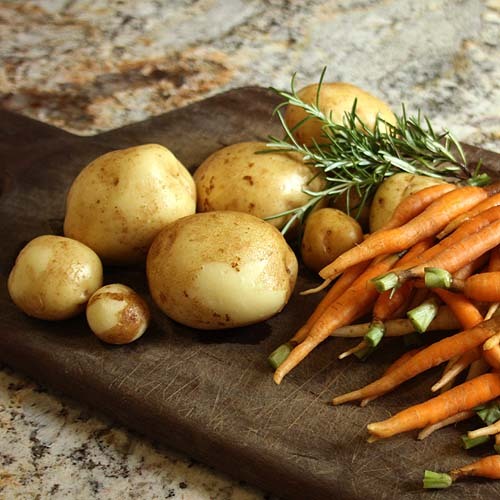 Brush the dirt off your potatoes, but don't wash them until they are ready to use. They will keep longer that way. I made herb roasted potatoes with my share from the CSA this week. It's a filling side dish with tons of flavor. Talk about comfort food. I love sautéed onions and garlic then add some rosemary with a base of roasted potatoes and I don’t even need a protein. I suspect this potato recipe would go well with just about anything any time of the year. Right now we are harvesting potatoes, onion and garlic at Hawkin’s Farm and there was enough rosemary to share. If you don’t have fresh rosemary, I could see thyme or sage also being delicious. 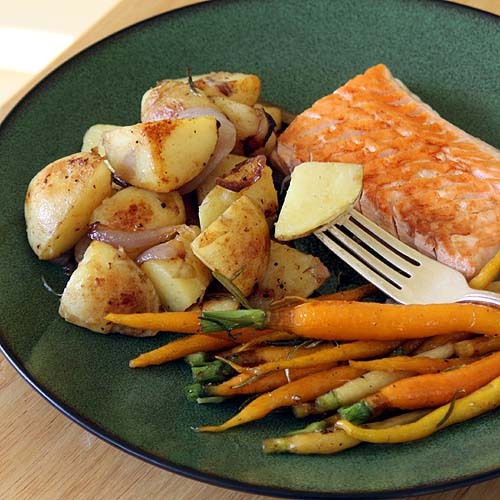 I served the herb roasted potatoes up with honey caramelized baby carrots and grilled salmon. It was a filling and delicious meal after a long day working in the garden in the morning and processing produce in the afternoon. Clean and cut the potatoes into one inch cubes. Slice the onion into half inch thick strips. Take the rosemary leaves off the branch. You should have about 2-4 tablespoons worth. Cut the garlic cloves in half or quarters depending on size. In a large heavy bottomed skillet, cast iron would be ideal, add the butter over medium heat. Add in the potatoes, garlic and onion and toss to coat. Then arrange the potatoes in a single level. The onion and garlic can be on top or to the side or where ever in the skillet. Let the potatoes cook until brown. Add the rosemary. Then turn the potatoes and continue until brown on all sides. The onion and garlic should brown and caramelize at the same time. Those are gorgeous Foy! We love digging potatoes but that won't come until MUCH later in the season down here. We start up in November! Wow! When did you plant? It's so strange to have the reverse season in the southern hemisphere. Although it is nice to know that somewhere it is winter when it is hot and sticky here. 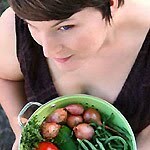 I was couldn't eat them either when I had gestational diabetes. Now that's over, it makes me appreciate them all the more! i didn't know that potatoes would last longer if you don't rinse them after brushing off the dirt. lovely garden. Homegrown potatoes are so good! well that looks very yummy! Very nice recipe! It looks nice on the photos.